" Articles in Category: DACA	"
The explosive reported allegations that the President of the United States had suborned perjury led to calls on Friday for Trump's impeachment, only to be dampened by a very rare --- and very carefully worded --- response from Robert Mueller's office, disputing "Buzzfeed's description of specific statements to the Special Counsel's office" and the "characterization of documents and testimony obtained by this office." 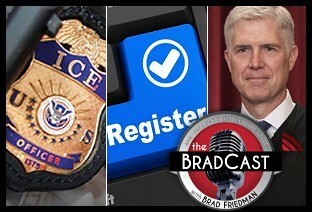 My guest today, legal and national security journalist MARCY WHEELER of Emptywheel, says those words were carefully selected by Mueller's office and for a very specific reason. Given all the confusion following both the report and Mueller's unusual statement late last week --- not to mention conflicting remarks from Trump's TV lawyer Rudy Giuliani over the weekend --- Wheeler helps us try to make sense of what is now known and unknown on all of this, why Mueller's office chose to speak out in response to it, and whether or not he was encouraged to do so directly by Deputy AG Rod Rosenstein, the White House or someone else on Trump's legal team. "Buzzfeed offered some particular details that match exactly with details that Mueller has offered," Wheeler explains, while noting that the news outlet "made a news claim that Trump had ordered this lie. What Mueller is pushing back against is a legal claim." She tells me how the two interests are different, even as they may be describing much of the same events and documentation. Moreover, she argues, "there's abundant evidence that Trump has ordered people to lie, and that subsequent to his orders to tell lies, his people have continued to tell those lies...and that's illegal. That should be a no-brainer and the press needs to start telling that story." Wheeler, who has long been covering all things related to the Trump/Russia probe as close --- or closer --- than virtually anybody in the nation, offers much insight today on all of the above, including details on Buzzfeed's sourcing for their report (which they continue to stand by "100%"), based on information from two unnamed "federal law enforcement officials involved in an investigation of the matter," as well as "multiple witnesses from the Trump Organization and internal company emails, text messages, and a cache of other documents." Also today, the U.S. Supreme Court, in a 5 to 4 vote, allows Trump's ban on transgender members of the military to move forward, even as ongoing cases in several lower courts have blocked his cruel directive, and even as at least one legal obstacle remains. In slightly more encouraging --- and certainly less cruel --- news from SCOTUS today, despite pleas from the Administration the Court made no announcement of plans to hear argument on any of the many ongoing lower court cases challenging Trump's reversal of the Obama-era Deferred Action for Childhood Arrivals (DACA) program. Obama's DACA order was meant to help prevent the deportation of more than a million undocumented immigrants brought here by their parents as children many years ago. Should the Court decide to hear one of the cases, it would now most likely not happen until the session that begins in October, with an opinion coming months later. Temporary protection under DACA for so-called "Dreamers" was used over the weekend as an attempted bargaining chip by Trump, as part of an offer to Democrats in exchange for the $5.7 billion he has demanded for a border wall, leading to the longest (and still ongoing) federal government shutdown in U.S. history. 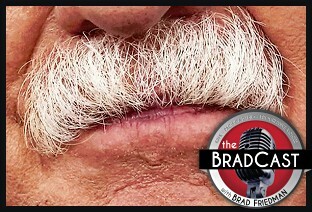 On today's BradCast, I'm in for Brad and Des as their holiday continues. Today, tomorrow, then they're back! Thanks for giving me your ears in their absence. No big surprises as the new Congress moves in - not in either house. 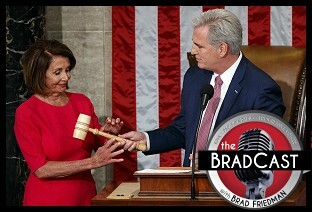 New Speaker Nancy Pelosi said all the right things - about bipartisanship, diversity, women, the border, health care, standing strong. Nice, listenable, good applause lines, and she seemed genuinely welcoming and warm to the kids she brought up to the podium to celebrate. Sorry for the cliché, but of course only time will tell if she can get anywhere with the House divided. With those kids in mind (what dreams do they have? Will we see any of them come back to the floor as leaders?) I check in with HANNAH EHRLICH of Lee and Low publishing house. Earlier this year she wrote this thoughtful piece on the PBS Great American Read poll. We talk about whether the diversity we're increasingly seeing in Congress is reflected in the books our kids are exposed to. Finally: Speaker Pelosi tipped her hat to health care, but we're a long, long way from the ideal: affordable care for everyone. Health care futurist JOE FLOWER has some solid advice on navigating the system we have now. Hold off on that colonoscopy or mammogram before you listen in. My whole hour with Joe is on my own show's website. 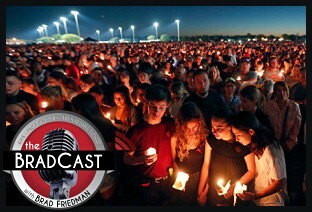 It's a worthwhile one-hour listen. And Trump's firing of Attorney General Jeff Sessions on the day after the midterms is quickly leading to a full-on Constitutional Crisis, as he has named Matthew Whitaker, a former political operative and opponent of Robert Mueller's Special Counsel investigation, as Acting AG responsible for overseeing that probe. Normally, the Deputy AG --- Rod Rosenstein, who had been overseeing it following Sessions' recusal --- would fill that role. It's feared Whitaker, a Trump loyalist, is likely to move to scuttle the Mueller investigation at any moment. In Florida, a "recount" now appears inevitable in the U.S. Senate race between incumbent U.S. Senator Bill Nelson and his Republican challenger Gov. Rick Scott, with the margin between the two at less than 0.22% as of airtime. That would trigger an automatic statewide hand count in the Sunshine State. 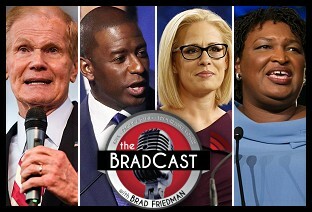 But there remain many questions about uncounted provisional and absentee ballots, as well as tens of thousands of suspicious undervotes in the Senate race reported by the paper ballot computer tabulators in Broward County. Some 25,000 voters, according to the computers, voted for down-ticket races like Agricultural Commission, but failed to vote in the top-of-the-ticket U.S. Senate race? In Arizona, there are nearly three-quarters of a million completely uncounted ballots across the state, leaving the results of the highly-contested and very close U.S. Senate race between Republican Martha McSally and Democrat Kyrsten Sinema in doubt. Arizona sources tell me that this many still-uncounted early and absentee ballots is now unusual for the state. But with all eyes on whether Democrats can flip the seat of retiring Republican Sen. Jeff Flake blue, a lot more people are now noticing. Sinema currently leads McSally by about one-half of a percentage point, according to the latest computer-tabulated numbers. And in Georgia, attorneys for Democratic gubernatorial candidate Stacey Abrams held a news conference today, in which they offered a blistering response to Sec. of State Brian Kemp's declaration of victory in the Governor's race, and his belated resignation as SoS along with it. Team Abrams charges there are thousands of wrongly rejected and still-uncounted ballots in the state, though --- thanks to Kemp's horrific administration of the election --- they are unable to know how many there actually are and how many voters were unlawfully prevented from voting at all. They forcefully repeated Abrams' Election Night vow to fight to assure that every vote is counted, even if legal action is required to ensure it. Finally, Desi Doyen joins us for the latest Green News Report, with both good news and bad for the environment from Tuesday's midterm elections. As the GOP's stolen U.S. Supreme Court further undermined American democracy today...and as climate change-fueled extreme weather resulted in a tar sands oil train derailing and leaking hundreds of thousands of gallons of crude into the drinking water supply for Iowa (and perhaps even Nebraska)....and as the President of the United States lied about immigration facts again while calling for the violation of both U.S. and international law by ending all Constitutional Due Process rights for those seeking asylum in the U.S....many of the always-reliable hand-wringers in the corporate mainstream media and the same Rightwingers who went all the way to the U.S. Supreme Court to support a bigoted baker who refused to bake a cake for a gay couple, are just beside themselves that some Administration officials are facing public protests for their abhorrent complicity in undermining so much that the U.S. supposedly stands for. There are now more than 11,000 children who have been separated from their parents at the southern border being held in detention centers across the country by the U.S. Government. It's unclear whether that number includes the 2,000 kids taken from their parents over a recent six week period, as reported by AP today, under the Trump Administration's new "zero tolerance" policy, which requires criminal, rather than civil, prosecution against those who cross the border unlawfully. Media reports this week include horrific stories of babies being ripped from their mothers' arms while breastfeeding and parents being told that officials are simply taking their children to bathe them, before they are shipped away to a detention facility. Somehow, Donald Trump and his White House are managing to blame all of this on Democrats, and Attorney General Jeff Sessions is justifying these new Dept. of Justice policies by quoting the bible. We cover some of those nightmarish stories, reports that an outdoor tent city, in sweltering southwest TX near El Paso, is being planned to store more than 400 more children --- who are now being separated from their parents at an alarming rate --- and a confrontation between reporters and Press Secretary Sarah Huckabee Sanders over these matters during a briefing on Thursday. In a separate, if related issue earlier in the week, Sessions issued a decision, attempting to change decades of U.S. immigration policy regarding asylum claims by immigrants fleeing their home countries on the basis of domestic abuse and gang violence. We're joined today by KAREN MUSALO, Professor of Law and the Director of the Center for Gender & Refugee Studies at the University of California Hastings College of Law to discuss the Administration's new policy. Musalo represents "A.B. ", the El Salvadoran woman whose grant of asylum by the U.S. Immigration Board of Appeals was unilaterally overturned by Sessions on Monday, along with his announcement of the Administration's cruel new policy which declares that domestic abuse will no longer be an allowable basis for asylum seekers. The longtime immigration rights attorney pushes back today, detailing the disturbing circumstances under which her client, Ms. A.B., fled her home country, explaining several poorly understood aspects of the U.S. Immigration Court system (which is part of the Dept. of Justice, not the federal Judicial branch --- so, judges work for Sessions), and stressing that the Attorney General is misinforming the public by claiming that asylum seekers fleeing domestic violence will no longer be allowed in the country. "Clearly what the Attorney General is trying to do with issuing this decision is to send a strong message that cases of women fleeing domestic violence or people fleeing gang violence are not legitimate asylum claims," Musalo tells me. "But for those of us who are experts and understand the law, and read his decision closely --- he may want to send that message, and he did in fact reverse a 2014 precedent that clearly stated that survivors of domestic violence were eligible for asylum --- but there's a whole framework of law that has developed in the 38 years since the 1980 Refugee Act was enacted." She says: "The reason I'm underscoring that point is that I think he's going to try to bully judges and asylum officers into thinking this is the law, there's no way around it, they should deny these cases --- and also, making lawyers think they shouldn't bring cases on behalf of their clients. So I feel it's very important to point out this is what he's trying to do, but that's not how the law is properly interpreted." Musalo also stresses that, despite reports of an increase in those seeking asylum from Central America due to domestic abuse since the 2014 change in policy, "The number of claims have not skyrocketed as a result of the Obama Administration recognizing domestic violence as a basis of protection. That's simply not true." "This has really made people rise up and say, "How can it be in the year 2018 that we have an Attorney General who says that you can send a woman to her death, back to a country where the police and the courts just sit by?," Musalo notes, citing Central American countries like El Salvador, Guatemala and Honduras with the "highest homicide rates in the world [and] the highest femicide rates in the world, denoting gender-motivated killings." There is a lot of important and enlightening information that Musalo imparts today --- more than I can adequately share in a short description here --- so I urge you to listen to the full conversation on today's program. First, a disturbing move by the Environmental Protection Agency on Tuesday suggests a very dark moment for American democracy as reporters from AP, CNN and elsewhere were blocked from attending a water contamination event held EPA Administrator Scott Pruitt. One AP journalist is said to have been "forcibly removed" from the building. That, just about one week after reports that the Trump Administration is blocking the publication of a major new report finding widespread water contamination across the country. That study is reportedly being withheld because the Administration believes it would be a "public relations nightmare" for the chemical companies involved, if it was released. Meanwhile, a federal court on Monday found Texas in violation of both the U.S. Constitution and the National Voter Registration Act (NVRA) for refusing to allow residents who update their drivers license online to register to vote at the same time, as required by the 1993 law. The Republican-controlled state appealed the ruling to the rightwing U.S. 5th Circuit Court of Appeals just minutes after it was issued by the U.S. District Court judge, all but assuring the case, originally filed in 2016, will continue beyond this November's mid-terms. And, speaking of Republicans who don't want certain people to vote, in Florida, John Ward, a GOP candidate for the U.S. House, was caught on videotape arguing that U.S. citizens from Puerto Rico who moved to the Sunshine State following the devastation of Hurricanes Maria and Irma last year, should not be allowed to register to vote in Florida and should go back "where they belong". 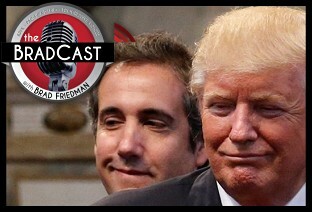 Next, we're joined by Slate's fantastic legal reporter MARK JOSEPH STERN to offer clarity on two disturbing, and very important cases this week. The first is the story of a 24-year old DACA recipient from Seattle who was brought here by his father when he was five years old and detained by the Immigration and Customs Enforcement (ICE) agency last year just after Trump took office. Daniel Ramirez Medina, a "Dreamer" with no criminal record, legally working in the U.S. after twice receiving protected status under the Deferred Action for Childhood Arrivals (DACA) program, was arrested by ICE in February of 2017 when they went to his house to detain his father. ICE subsequently booked Ramirez, lied about him --- blatantly doctoring a document to make it appear Ramirez admitted to being a member of a non-existent gang (he never was) --- in order to remove his protection and begin deportation proceedings. Last week, U.S. District Judge Ricardo S. Martinez, a George W. Bush appointee, found that ICE repeatedly lied about Ramirez and to the court about their evidence against him. "Judge Martinez is no flaming liberal, but he looked at the evidence before him, and he was clearly disgusted and incensed by what the agency had done," says Stern. He describes how Ramirez was saved, for now, only due to his protected status under the Obama-era DACA program, which Trump continues to try to kill. "The only reason that this story rose to the top, and that it actually got before a federal judge who could rule on it, is because this guy is lucky enough to have DACA status. So he had this extra layer of protection that most undocumented immigrants don't have." Unfortunately, the dishonest tactics ICE attempted to use against Ramirez are usually successful, Stern says, explaining, "ICE agents do this all the time". Then, we turn to an outrageous 5 to 4 decision by the stolen, rightwing U.S. Supreme Court this week that demolished the clear, statutory right established by decades-old New Deal-era labor reforms, allowing employees to file collective class-action lawsuits against their employers for wage theft. As Stern explains, Monday's hypocritical and legally erroneous majority opinion in Epic Systems v. Lewis [PDF], written by the corrupt, self-proclaimed "textualist" Justice Neil Gorsuch (who occupies the seat stolen for him by the GOP Senate after Antonin Scalia's death in early 2016), was blasted by a furious Justice Ruth Bader Ginsburg in her minority opinion, as the ruling, according to Stern, "effectively legalizes low-level wage theft" and is "nothing less than catastrophic for workers across the country." It's really even worse than you may have heard --- if you even heard anything about it. But, Sterns adds with a glimmer of hope, the law in question that was blatantly misinterpreted by Gorsuch's judicial activism could very easily be amended for clarity in order to reverse this SCOTUS decision. The fix, however, would likely require a Democratic Congress and a cooperative President. 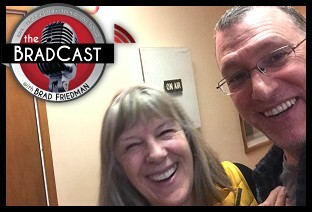 We've got lots to discuss today with Kennedy, a longtime progressive activist and leader (that's her and me in the photo above, just after today's show), and we also open up the phone lines to callers as well. And whether elected Democratic officials and 2020 Presidential hopefuls are finally understanding the importance of single-payer "Medicare for All" (or, as PDA has been advocating for years: "Healthcare not Warfare!"). Also on today's show: More tentatively encouraging news on the Korean Peninsula (at least until Trump screws it up again); Trump's artificial DACA deadline hits, endangering hundreds of thousands of young immigrant 'Dreamers'; Another senior Republican U.S. Senator, Thad Cochran of Mississippi, announces that he is resigning, as of next month. Another top White House official, Trump's 29-year old Communications Director Hope Hicks (his third since taking office), says she's resigning, and offered a ridiculous reason for it, just one day after admitting to the U.S. House Intelligence Committee that she has been required to lie on behalf of Trump. The federal judge who Trump attacked during the campaign for allegedly opposing his border wall, as the court case for Trump's fraudulent 'Trump University' played out, decides in favor of the Administration scheme to waive environmental laws to build that wall with Mexico. Then, we're joined by immigration policy analyst DAVID BIER of the libertarian Cato Institute, following his recent appearance at the Conservative Political Action Conference (CPAC) --- where his presentation of independently verifiable facts and data detailing how immigration is actually good for the country --- was met with derision and heckles from the audience and fellow panelists alike. 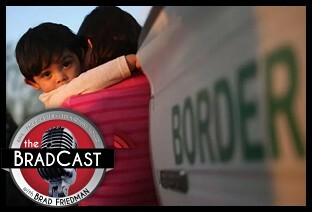 Setting our many political differences aside for purposes of this discussion, Bier offers some of that data on today's show, in hopes that we can, at least, agree on facts if we are ever to find a legislative solution to protect "Dreamers" and turn back the new Trump/GOP efforts to restrict even legal immigration to our country. 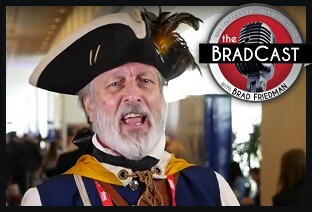 Among those derided and heckled facts Bier presented at CPAC: "I talked about how some conservative outlets really like to focus on immigrant crime. But we know from the U.S. Census bureau that immigrants --- including illegal immigrants --- are about half as likely to be incarcerated in the United States for serious crime than U.S.-born adults. So they're really focusing on the exceptions to the rule. Something else that I cited is the National Academies of Sciences 2016 report on the fiscal costs of immigration, that found that the average recent immigrant will pay at least $92,000 more in taxes than they receive in benefits from the government over their lifetime." He went on to debunk a number of other myths offered by right-wing outlets, such as on English-language comprehension and assimilation of new immigrants and the claim (even made by the host of the panel) that Democrats favor immigration because they want millions of new voters. He also detailed how new immigration is needed to help support Social Security and Medicare for many of the aging baby-boomers who were, no doubt, among the many attendees at CPAC. Bier told me about the reaction to his remarks at the only immigration-related panel on the weekend's agenda at the annual far-right Republican gathering, how that response may have differed from previous years, and why it is that he believes attendees are so terrified of independently verifiable facts on immigration's many benefits for all Americans --- economically, politically and culturally. He even managed to offer a fairly impressive response to my skepticism to his claim that "the data is the thing that’s going to win people over." Despite appearances from this President and his administration, he argues, immigration advocates are winning. "You and I and everyone who favors legal immigration and legalizing long-term residents of the United States, we're winning that argument. The public supports our position overwhelmingly. It's never been higher in terms of support for legalization, support for a pathway to citizenship for Dreamers, support for not restricting legal immigration. We're winning all of those things." "It's sort of their last stand before the end," he asserts, by way of explaining the confused and fearful anti-immigrant CPAC attendees. "If Democrats do take over, I fully expect immigration reform will happen. And that will be the moment where they realize they lost the argument." Now that both the U.S. intelligence community and Democrats --- and even a few Republicans --- have finally begun to figure out that Election Integrity requires, at a bare minimum, a paper ballot for every vote cast, how long will it take them to figure out that those ballots need to be hand-marked (not computer-marked) and, preferably hand-counted, so that the American public can truly begin to restore confidence in election results and know that their votes actually matter? There is some --- precious little, but some --- encouraging news out of Pennsylvania today on that front, and even from the U.S. Senate Intelligence Committee. The Governor in PA, a state which still hates its voters so much that it forces the vast majority of them to vote on 100% unverifiable touch-screen voting systems, has decreed that any new voting systems purchased to replace the old ones, must have some form of "paper trail" or "paper record" or "paper backup". That's a very low bar, but better --- for the most part --- than the current 100% unverifiable touch-screen systems used across the state. Yet, the Democratic Governor, Tom Wolf, has yet to propose any new funding to purchase those new systems. So, like PA votes, they remain vapor ware for the moment. But, even if we had a hand-marked paper ballot for every vote cast and even if we counted them all by hand, publicly at the precincts, before ballots were moved anywhere (as per Democracy's Gold Standard), Democrats would still have a mountain to overcome this year in the shape of the GOP's systemic partisan gerrymandering of state legislative districts and U.S. House seats. To that end, we've got some similarly-qualified encouraging news out of Pennsylvania as well today, where the state Supreme Court recently ordered new U.S. House maps to be drawn in time for the upcoming May primary elections in the commonwealth, after finding the ones drawn by Republicans following the 2010 census were in violation of the state constitution's right to a fair vote. The battle over those new maps --- which have given the GOP a 13 to 5 advantage in U.S. House seats in the largely 50/50 state over the last three elections, where Dems outnumber Republicans --- is now moving forward on a very tight court-ordered deadline. Meanwhile, similarly partisan gerrymandering by the GOP in Wisconsin, North Carolina, and many other swing-states continues, thanks in no small part to the U.S. Supreme Court delaying lower federal rulings that determined Republicans had unconstitutionally given themselves a steep enough advantage on district maps that they were able to retain huge majorities in state legislatures and the U.S. House, despite being consistently out-voted by Democrats. We're joined today by FairVote gerrymandering expert DAVID DALEY, former Editor-in-Chief at Salon and author of RATF**KED: The True Story Behind the Secret Plan to Steal America's Democracy. 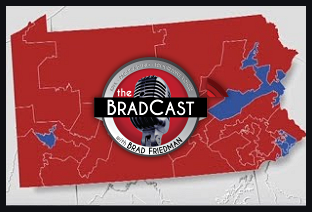 We discuss the gerrymandered state of play as the 2018 primaries are now just weeks away in many states, and as the dam seems to be bursting in both state and federal courts --- finally! --- against partisan gerrymandering. "The courts have been consistently outraged by what the Republicans pulled off in 2010, 2011," Daley says. "The problem is, here we are in 2018, we've been using these unconstitutional maps now this entire decade. There is no sense we're going to have new maps in most of these states, with the possible exception of Pennsylvania, in time for the 2018 election. We may well have the fourth of five elections in all of these states held on unconstitutional maps." By way of one example, Daley notes: "In 2012, 52% of Pennsylvanian voters vote for Barack Obama, 51% of them vote for Democratic members of the U.S House. Republicans however, take 13 of the18 seats that year --- 71% of them! Democrats get 28% of the seats, even with more votes." We also discuss the new documents he recently uncovered, published in a new Salon exclusive, detailing the fascinating story of how the Republicans' so-called REDMAP scheme to take over state legislatures and redistrict the nation with a wildly partisan advantage, first came about prior to the 2010 election and U.S. Census. Among the questions we discuss: Is it even possible for Democrats to overcome that structural disadvantage in the 2018 mid-terms without the U.S. Supreme Court finding partisan gerrymandering to be unlawful? Are state court cases, like the one in PA, the answer instead? And can any of this be done in time for the 2020 elections, after which district maps will be redrawn once again by partisan majorities in state houses for another 10 years? "There may be a blue wave [in 2018], but there is also a red firewall that stands ready to knock it down," Daley warns. "Democrats are probably going to need two seismic, historic waves in order to have a shot at fair maps in 2021. And it they can't pull that off, and if the courts don't come in and do something in the meantime, the maps that are drawn in 2021 are the ones we are going to live with until 2031." 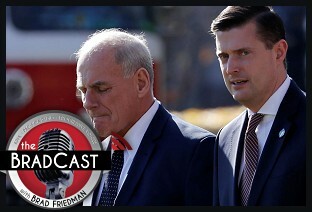 White House Staff Secretary Rob Porter finally resigned on Wednesday, but not before Donald Trump's Chief of Staff John Kelly fought hard to keep him on board and wildly sang his praises, even after reportedly being told long ago that Porter's two former wives had both accused him of physical and emotional abuse, which they had notified the FBI about as early as January of 2017. It wasn't until a graphic photo of one of the women with a black eye --- which she says she told the FBI that Porter had caused when he punched her while on a vacation --- was published, that the White House finally got around to backing off the praises they had been singing for him. That, even while Porter had been handling the nation's most classified information along with Kelly, despite being unable to obtain a full security clearance, thanks to his violent and abusive background. We cover many of the developing details in that grotesque story, including some of the remarkable (and shameful) reaction to it today. Then, the 2018 Affordable Care Act enrollment numbers are finally in and suggest that Americans, even in states won by Trump in 2016, sure do like ObamaCare! Nonetheless, the White House and Republican states are still doing all they can to take health coverage away from Americans, particularly those that need it most. Several GOP states have now applied for waivers to allow them to put lifetime limits on the use of Medicaid for the first time in the history of the crucial social safety net program. We start with some of the good news for Democrats, as yet another special election on Tuesday has resulted in yet another state legislative seat flipped from "red" to "blue". This time it was a special election for the Missouri House in a district where Trump is said to have won by 28 points in 2016. The stunning victory continues a tidal wave of Republican seats picked up by Democrats since Donald Trump took office last year. There is less good news for Republicans, however, as a holocaust denier and actual member of the American Nazi party is now set to become the GOP's nominee for the U.S. House in Illinois' 3rd Congressional district this fall. Meanwhile, U.S. Senate leaders Mitch McConnell (R-KY) and Chuck Schumer (D-NY) announced a breakthrough agreement on Wednesday to keep the federal government funded and open in advance of Thursday night's shutdown deadline. The deal, if adopted by both chambers of Congress, would increase both military and domestic spending by some $300 billion, includes additional disaster relief to states rebuilding after last year's hurricanes, funds community health centers for several years, and increases the debt ceiling to avoid a government default, as lost revenue following the GOP's $1.5 trillion tax cut last year means federal borrowing must be increased sooner than previously expected. The deal, however, does not include protections for "Dreamers", those who immigrated here with their parents years ago, who now face the possibility of mass deportation as early as March 5, after Trump reversed the Obama-era DACA program that had previously protected them. Some progressives and self-identified conservatives in the U.S. House oppose the Senate plan, including House Minority Leader Nancy Pelosi (D-CA) who took to the House floor today for a record 8-hour marathon speech to highlight the DACA issue and contributions made by hundreds of thousands of "Dreamers" who have lived here most of their lives. Pelosi says she opposes the Senate bill and called on House Speaker Paul Ryan (R-WI) to promise a vote on immigration issues, as McConnell has in the Senate. Freedom Caucus Republicans in the House also claim to be upset by the bill, thanks to its additional new government spending. So, it remains to be seen if today's breakthrough package will make it to the President's desk before the midnight Thursday deadline or not. Either way, it doesn't appear that a fix to DACA will be included, assuring more continued uncertainty for some 800,000 previously protected Dreamers who could soon face deportation. 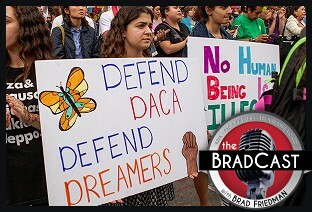 We're joined today by JESSICA HANSON, attorney at the National Immigration Law Center, to discuss how a recent federal court ruling, temporarily blocking some of Trump's attempted DACA reversal, may effect his March 5 deadline for legislation to protect "Dreamers", as well as the rise of white nativism in the GOP, including Trump and his Chief of Staff John Kelly. Hanson explains the "temporary reprieve" by a federal court ruling in California that has allowed "individuals who have had DACA previously to renew their DACA grant." But, she says, while NILC recommends such renewals, even where some may have already expired, she notes that those who never had DACA protection are still out in the cold, at the moment, as "the government took the unusual step of seeking to skip the 9th Circuit and instead appeal directly to the Supreme Court" in the ruling. In response to recent remarks from Kelly, alleging that those not covered by DACA were "too lazy to get off their asses" and that he "doubts very much" Trump will extend the program beyond March 5, Hanson charges: "Those remarks reflect an ongoing, deep, white nativist sentiment with this administration that has shown itself over and over again." We also discuss a number of other related issues, including Trump's lies about our legal immigration policies, such as the Diversity Lottery and Family Reunification programs that he is now trying to restrict and ties to a DACA deal ("The President has been completely misrepresenting these programs," explains Hanson, who describes it as yet another effort "to make America white again"), and concerns about millions of other American immigrants already being terrorized by detention, deportation and separation from their families, business and lives under Trump's radical anti-immigrant policies. She joins NILC in decrying today's Senate deal, charging that "it is inexcusable that the Senate leadership has agreed to put immigrant issues aside" and explains that "the mainstream media could do a lot more to lift up these stories" about abuses by Trump's immigration enforcement agencies like ICE and CBP, "because a lot of people don't realize it's happening [and] have no idea that this is going on." Then, Republicans on the U.S. House Intelligence Committee have finally voted to release the Democratic Rebuttal Memo written in response to the cherry-picked Republican Memo produced by committee Chair Devin Nunes (R-CA), perhaps in collusion with the White House. The Nunes memo, though landing with a thud after it's release on Friday, is still being used by Fox "News" GOPers to falsely make the case that Robert Mueller's Special Counsel probe must be shut down due to an alleged misuse of material from the so-called "Trump/Russia Dossier" written by a former British intelligence agent, for the FISA warrant application sought and obtained by the FBI in 2016 (and renewed three times) to intercept communications with Carter Page, a former Trump Campaign advisor and suspected Russian asset. But will the President actually allow the House Democrats' rebuttal memo to be released to the public? Parton has her doubts ("I don't know why people think it's a done deal. I mean, I keep wanting to say, 'Have you met Donald Trump?!'") She also has a few thoughts on Nunes and the entire GOP attempt to undermine the Mueller probe on specious grounds and on the promise by Nunes' to produce several new memos in what is part of his new effort to make the case that Hillary Clinton, not Donald Trump, conspired with Russia before the 2016 election. Parton compares the effort to go after members of the FBI and DoJ, etc., to Sen. Joseph McCarthy's targeting, in the 1950s, of alleged Communists in the FBI, Dept. of Justice and State Department. Sadly, the effort by Nunes, Trump and friends seems to be working, at least partially, according to a stunning new Axios poll. I also share my own concern with Parton about what I see as a serious weakness in the Democrats' case for "collusion" against Trump, and she shares her prediction that "there's an excellent chance" a second Special Counsel will be convened to try and prosecute Hillary Clinton before this is all said and done. 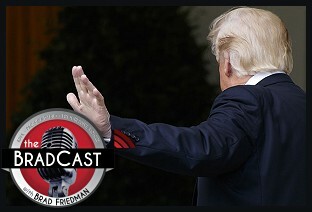 We then go on to discuss the mess in Congress in advance of another possible federal government shutdown later this week, which Trump, on Tuesday, said he welcomes amid what has been his own bad faith deal-making with Democrats over the fate of some 800,000 children of immigrants brought here illegally decades ago. Those kids had been protected from deportation by the Obama-era DACA program, until Trump reversed it --- using them as human shields for his radical new immigration demands --- setting a deadline to begin their deportation as early as March 5th, unless a deal can be struck for legislation passed by Congress to protect them. "This is a mess. It's been a mess," Parton argues. "Giving the Democrats a little bit of slack, this immigration problem and the DACA kids have been out there for a long time, and they have tried. The problem for the Democrats was that they thought, when Donald Trump was elected, because of this promises "Oh, I love the [DACA] kids! ', that he had the credibility to bring along the Freedom Caucus and all these right-wing anti-immigration hawks in the Congress. That was the game that Trump talked. It turns out that he's a complete mess. He doesn't know how the government works. He doesn't know how to negotiate." So, now, such a deal must somehow be worked out between the Dems, who are lousy negotiators, and Trump, who is a dishonest one, in advance of Friday's government shutdown deadline, or be pushed off yet again, leaving the fate of the DACA kids in jeopardy as March approaches. Not helping in the matter, as Parton observes, is Trump's far-right, anti-immigrant Chief of Staff John Kelly, not to mention the untrustworthy Senate Majority Leader Mitch McConnell. Next, Desi Doyen joins us for the latest news-filled Green News Report. And, finally, some new developments out of Pennsylvania where, speaking of the rise of authoritarianism under Republican rule, an elected GOPer in the state House is now moving to impeach five of the seven Justices on the state Supreme Court after they voted to require new U.S. House maps for the state. The new districts would replace the GOP's illegally gerrymandered Congressional Districts that Republicans have been using to hold 13 of 18 U.S. House seats in the closely divided (but Democratic-leaning) swing-state. The nascent impeachment effort --- though one that should be taken seriously --- in the PA House comes as the Republican President of the state Senate continues to defy the court's orders, despite their ruling being upheld by the U.S. Supreme Court on Monday.